A Seahorse, Salps, and Styrofoam Cups? The Pisces has made its final trawl and is now heading towards its last plankton station before it will dock in Little Creek, Norfolk, Virginia for the end of this cruise later today. 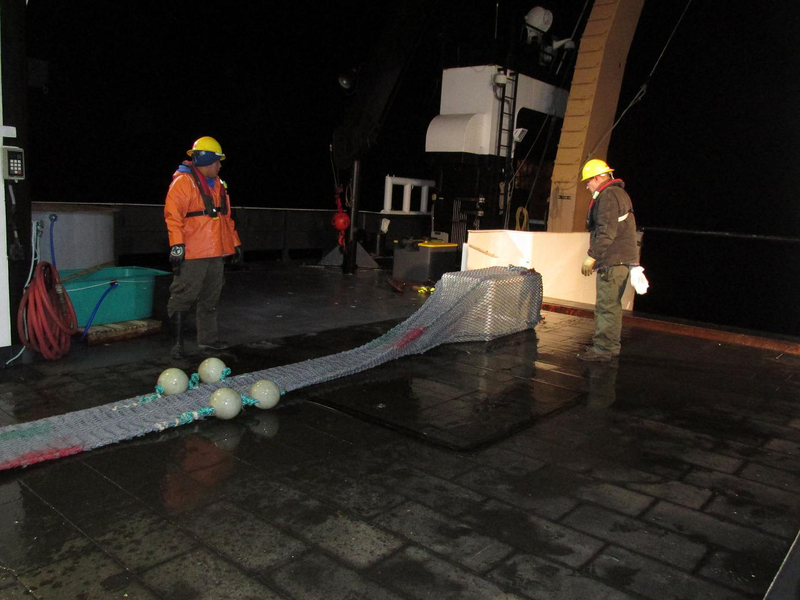 Since our last update we’ve weathered persistent gale-force winds that caused us to miss our first and only station of this entire survey, when gusts of forty knot winds forced us to abort setting the Shallow-Water midwater trawl just before dawn on Monday morning. We altered course to continue working in a more sheltered area further south. Subsequent trawls made late last night have been small in quantity but highly diverse in composition, with cutlass fish, bluefish, a puffer fish, small squid, salps and even a seahorse! We are now heading for our last plankton station which we should arrive at in the wee hours of this Wednesday morning. 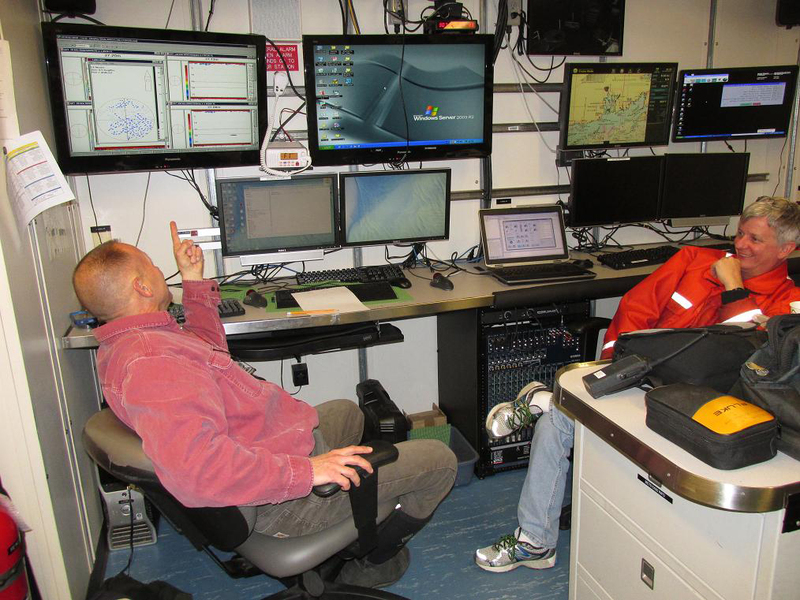 This has been an interesting cruise owing to its multi-pronged approach for studying the waters of the northeast continental shelf. Using a variety of tools wielded by scientists from different disciplines, marine life from phyto- and zoo-plankton, to larval, juvenile and adult fish have been studied, together with a backdrop of oceanographic measurements of water temperatures and salinities, and light, chlorophyll, and nutrient levels. 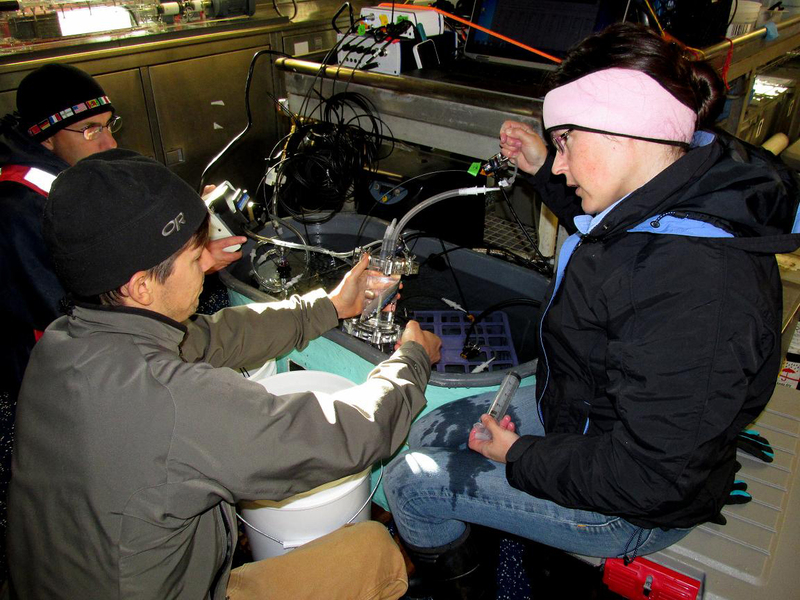 The onboard experiment to measure respiration of various fish was a first for one of these survey cruises. There has also been an educational component, where students from Prout High School and Davisville Middle School in Rhode Island, sent highly decorated styrofoam coffee cups and manikin heads out with us to be submerged along with our instruments to depths of 500 meters (1,640 feet) to demonstrate the effect of pressure on them. 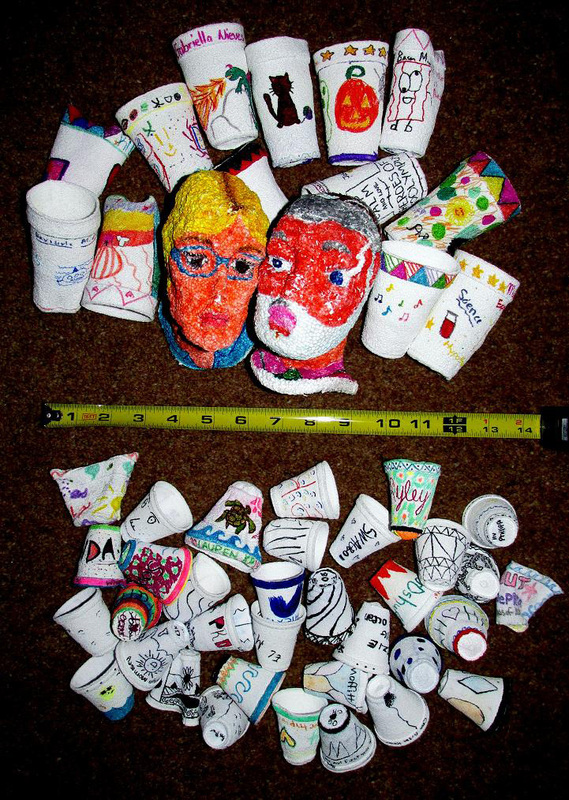 Styrofoam cups and manikin heads from Davis Middle School (top) and Prout High School (bottom) after 36 submersions on CTD rosette. Photo by Jerry Prezioso, NEFSC/ NOAA. All of this was accomplished in an area ranging from as far north as the Bay of Fundy in the Gulf of Maine, to as far east as the Northeast Channel off of Georges Bank, down to Cape Hatteras, North Carolina in the south in just seventeen days. Truly a remarkable achievement, and we, the scientists on this survey, want to thank the officers and crew of the Pisces for doing their utmost to make this possible. By utilizing this vessel to its fullest capabilities, and with their constant help and advice, they have enabled us to accomplish a lot in a short time. We thank you and wish you all a very Happy Thanksgiving! Since transiting the Cape Cod Canal on Thursday, the Pisces has continued its remarkable rate of progress in Southern New England waters. As of 6 p.m. Saturday night (November 15) we are outside of New York harbor and working our way further south towards the New Jersey coast. Tows in these inshore waters have had large amounts of phytoplankton, and catches of salps and ribbed jellyfish have been in several of our plankton tows. 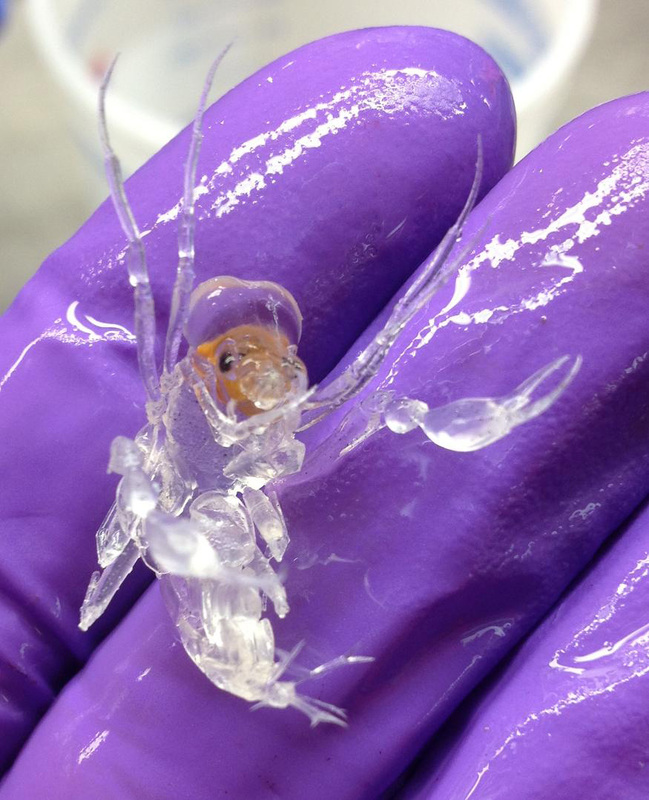 We also had ribbed jellyfish in one of our most recent shallow water mid-water trawls, along with a couple of juvenile butterfish and a few larval menhaden. 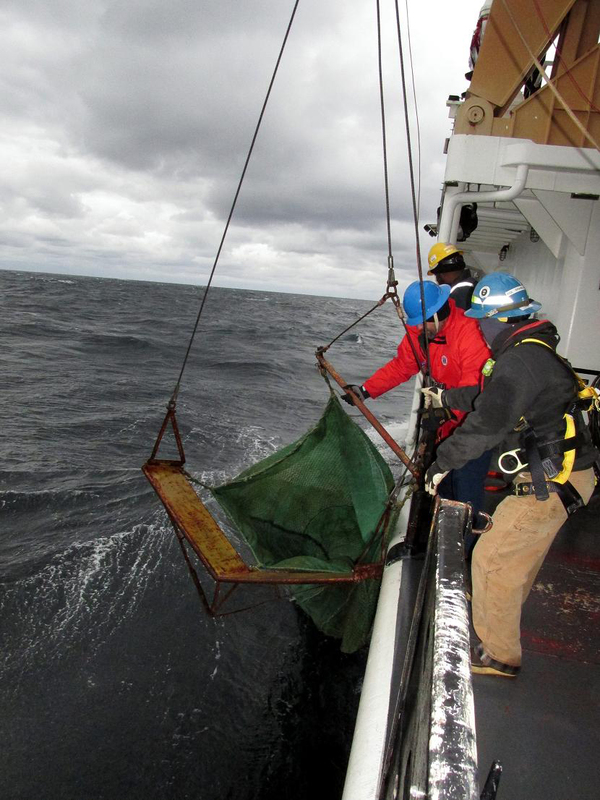 Some earlier mid-water trawls had squid and lanternfish. Pisces cruise track as of 6 p.m. November 15, 2014. Image courtesy of NOAA Shiptracker website. We have been striving to catch our fish with as little trauma as possible for oxygen consumption measurements, but have had difficulty keeping most of them alive. 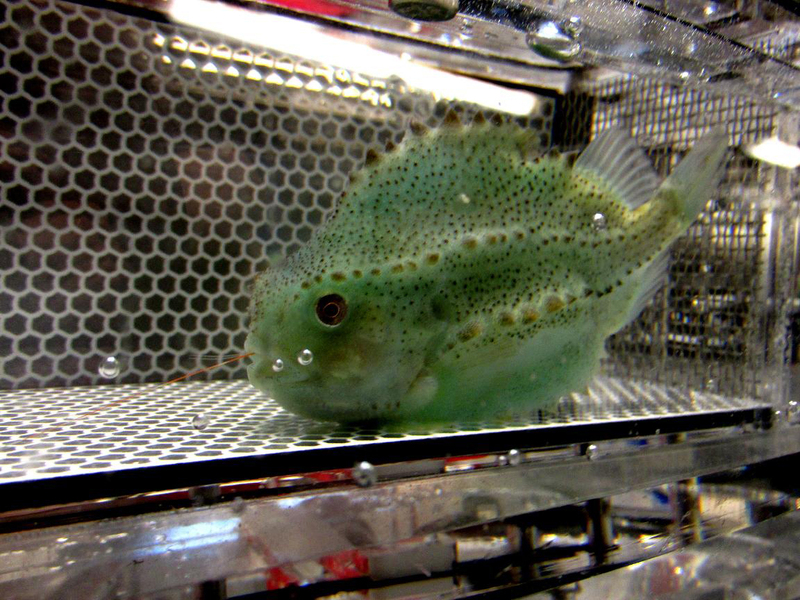 We have gotten good data from “Lumpy” the lumpfish, who is still on board and doing well, from some sand eels and a paper nautilus. 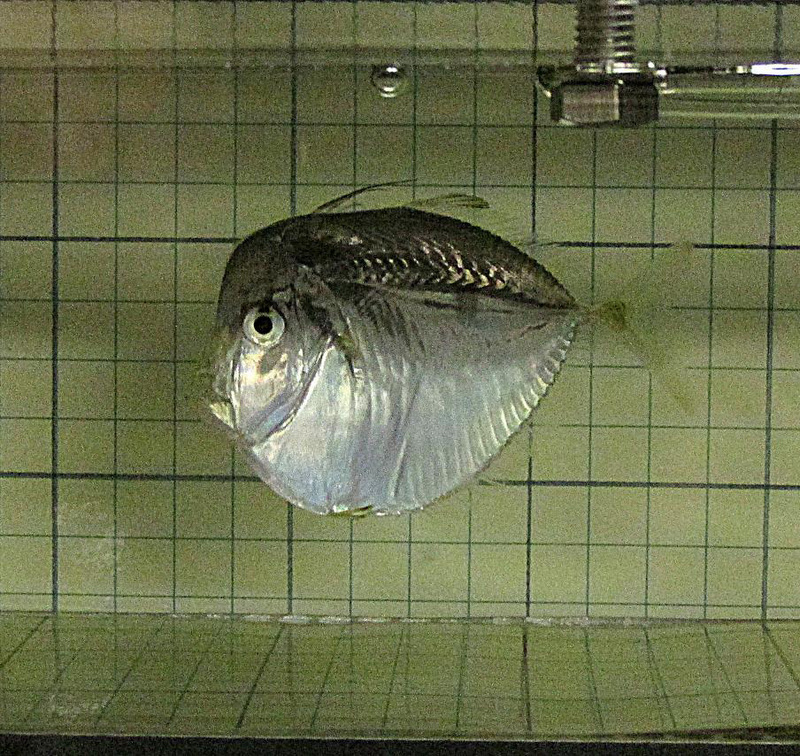 Our latest tenant of the respirometer is a lookdown, a shiny silvery fish which is not only about the size of a half dollar, but resembles one as well! We had hoped to make measurements on butterfish, but have not had any success in keeping them alive long enough to place them in the respirometers. To address this issue the scientists and crew worked together yesterday to come up with a tub that is placed inside the codend of the trawl to provide a soft landing place of undisturbed water at the back of the net for at least some of the fish that are scooped up, and also to keep them submerged in water while the net is being dragged up the trawlway and onto the deck. We think that if we can address these issues of capture trauma we may have a better chance of getting some candidates for the respirometers. So far we’ve only caught a few squid and lantern fish in the tub. The squid were alive and well, but the lanternfish were not. The lanternfish did however appear to be in much better shape than ones we have caught just using the trawl alone, so we feel we are making some improvements. Now we just need a good catch of butterfish to give our design a real test! 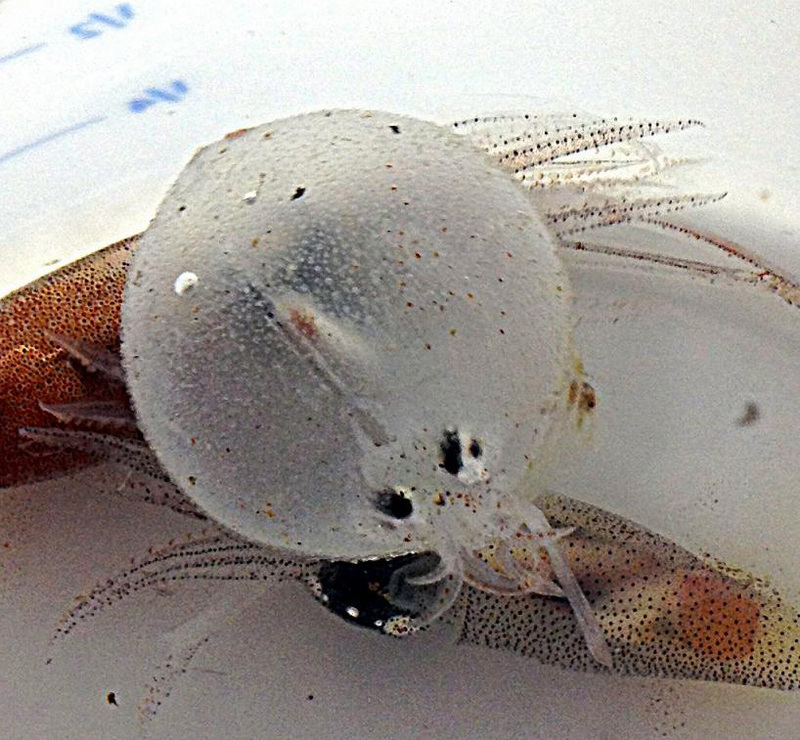 We are continuing to catch a few oddities, such as a balloon squid, so named for its round shape, and also some Phronima, the latin name for a small amphipod that feeds on salps and then lives inside the clear salp body, swimming it around like a little barrel-shaped house. 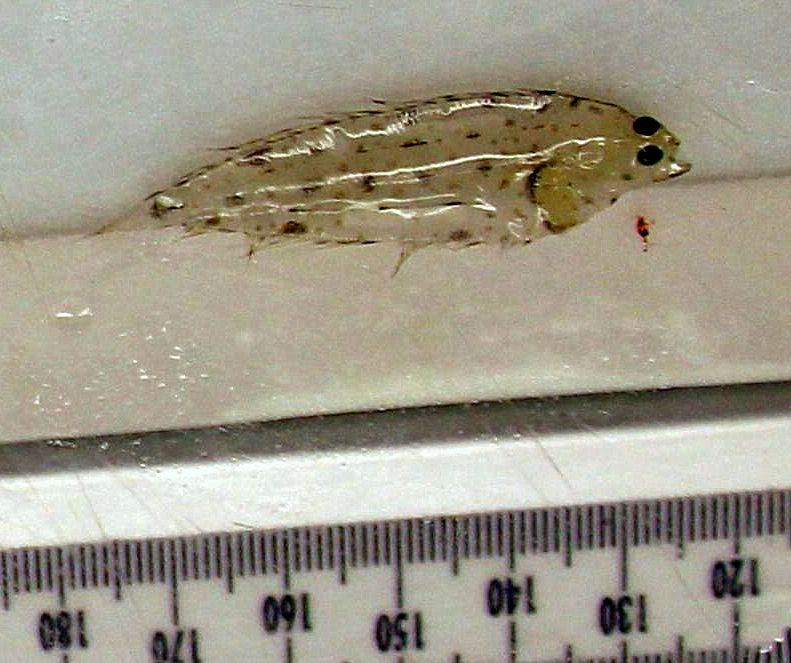 This thumb-sized crustacean is reputed to have been the inspiration for the appearance of the alien creature in the series of Alien movies! The NOAA ship Pisces reached the sea buoy at the entrance to the Cape Cod Canal at 0630 this morning for a sunny but cold transition from the comparatively balmy Gulf of Maine to the waters off the Southern New England coast, now engulfed by a cold front that has crossed the country to meet us. We heard snow is in the forecast for some of this area on Friday! 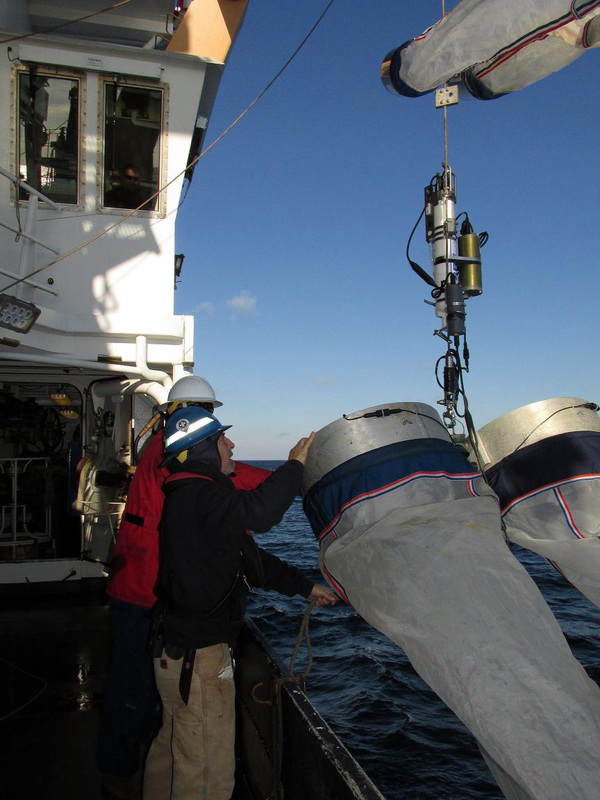 We have been blessed by mild, calm conditions for much of our time in the Gulf of Maine, and consequently have been able to sample at every single planned station both there and on Georges Bank, a goal we are not often able to achieve at this time of year. We have now completed 74 bongo net plankton tows, 22 CTD rosette water casts, 14 Shallow-Water Mid-water Trawls, and 2 Isaacs-Kidd Midwater Trawls on the first half of this trip. 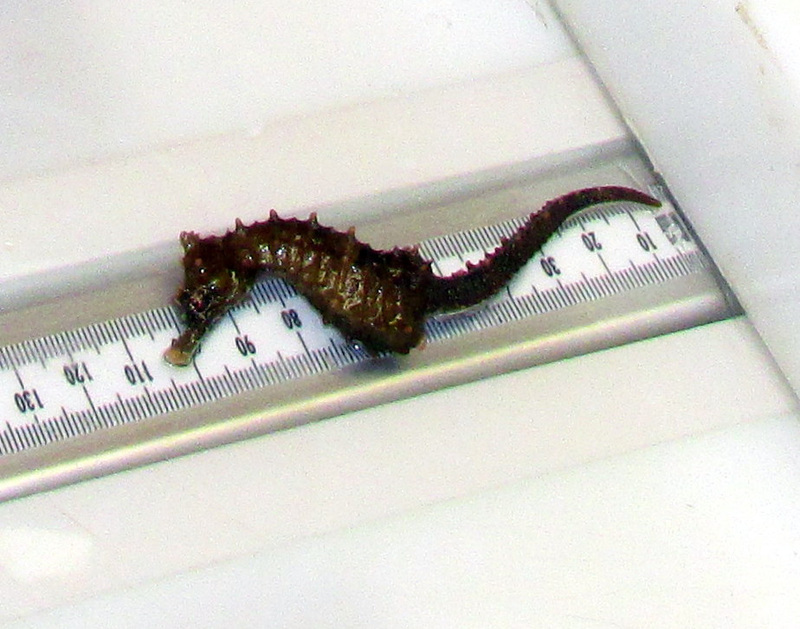 The catches from the Shallow-Water Mid-water Trawls have been pretty small for the most part, but diverse. Last night’s first tow yielded dogfish, butterfish, herring, red and silver hake and even a paper nautilus, which is a rarity in northern waters! 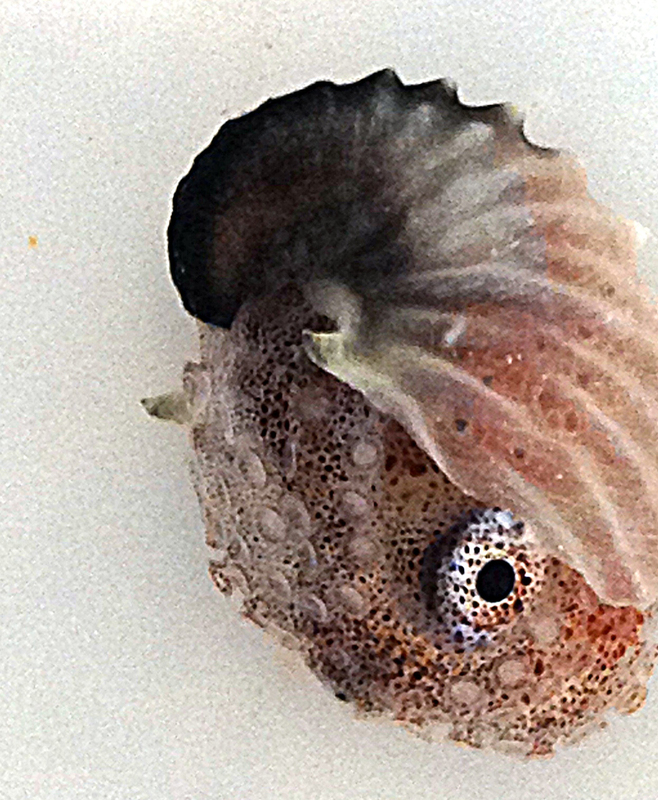 The paper nautilus is doing quite well, and has even taken a turn in one of the respirometer chambers. Other oddities we have picked up from our tows include the pelagic larva of a witch flounder, a viperfish, a white barracudina, and a glacier lanternfish. 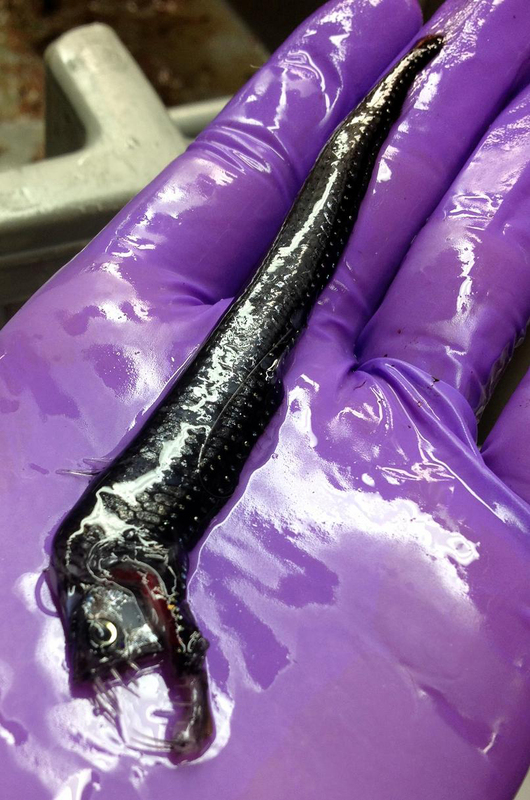 A viperfish. Photo by Dan Vendettuoli, NEFSC/NOAA. Paper Nautilus. Photo by Dan Vendettuoli, NEFSC/NOAA. As I am writing this we are approaching a station south of Block Island. 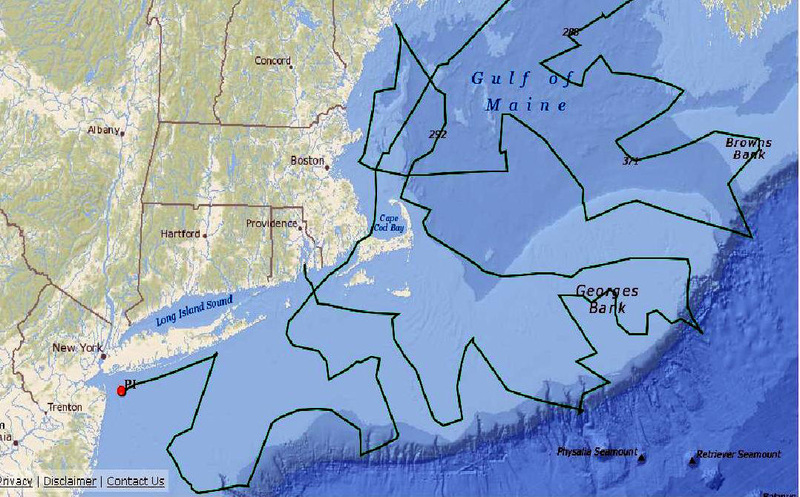 We are planning to sample at 58 more stations from Southern New England down through the Mid-Atlantic Bight, and will try to get in as many as two mid-water trawls per day over the remaining seven working days we have left. Hopefully our good weather luck will continue! I will continue posting these updates with photos on the website nefsc.wordpress.com. Since our last update on Saturday the Pisces has completed sampling the southwestern Gulf of Maine stations and started working east across the northern flank of Georges Bank and into the eastern Gulf of Maine area. We have just completed sampling at the Northeast Channel and are currently heading for Browns Bank. We have made a few more midwater trawls since last time with the Shallow Water midwater trawl and one with the Isaacs-Kidd midwater trawl. Although the catches have been very small, consisting of a few silver hake and Atlantic herring, we did manage to get a few fish to try out in the respirometer chambers. 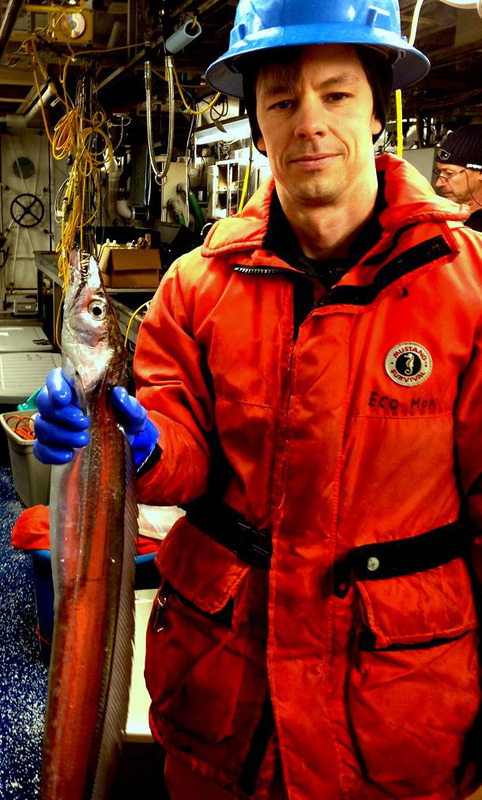 Some data was collected from the Atlantic herring caught this past weekend. We had one butterfish which didn’t do well in the chamber, but we had better luck with a lumpfish, which is currently still in the chamber and yielding good data. “Lumpy”, as he has been christened, even managed to gulp down a shrimp from the holding tank which was still sticking partly out of his mouth when he was transferred to the respirometer. Oxygen consumption data has been gathered from this fish for several hours now, showing a series of classic oxygen consumption curves, when the amount of oxygen in the water is plotted over time. The oxygen level in the chamber with the respiring fish starts at a high level, then drops at a steady rate until freshly oxygenated water is introduced, and the cycle repeats itself, with the rate of decline changing depending on the stress levels of the fish. 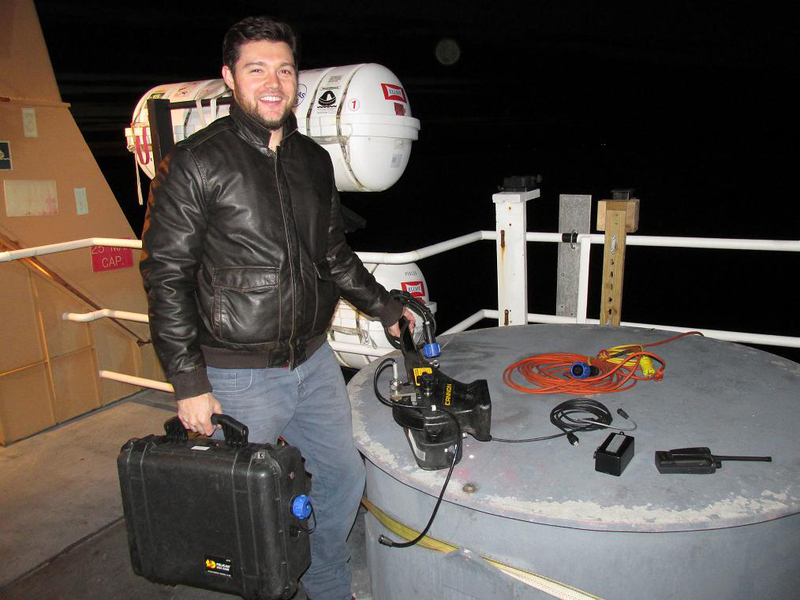 The logistics of the respirometry project have been daunting, but the researchers have met the challenges of plumbing, software, and obtaining viable fish, all while working under typical November sea conditions to start getting some positive results. Pictures of this interesting, on-board experiment will be posted on the nefsc.wordpress.com website. This work has been in addition to the continued collection of plankton samples, hydrographic data, and trawl catch assessments. With a favorable forecast for the next few days, the Pisces is currently steaming along at between twelve and fourteen knots to cover the Gulf of Maine before the next front is due to hit us later this week. We hope to be in sheltered waters near the entrance to the Cape Cod Canal by then, poised to move on to the southern portion of this survey which will take us to Southern New England and the Mid-Atlantic Bight. before Friday, so we continued working north into the western Gulf of Maine, with an eye on the approaching storm which did finally reach us on Friday night. With winds reaching as high as 40 to 50 knots, the vessel turned towards the coast and after reaching a station off of Portland, Maine in the wee hours of Saturday morning was able to continue working in the sheltered inshore waters. 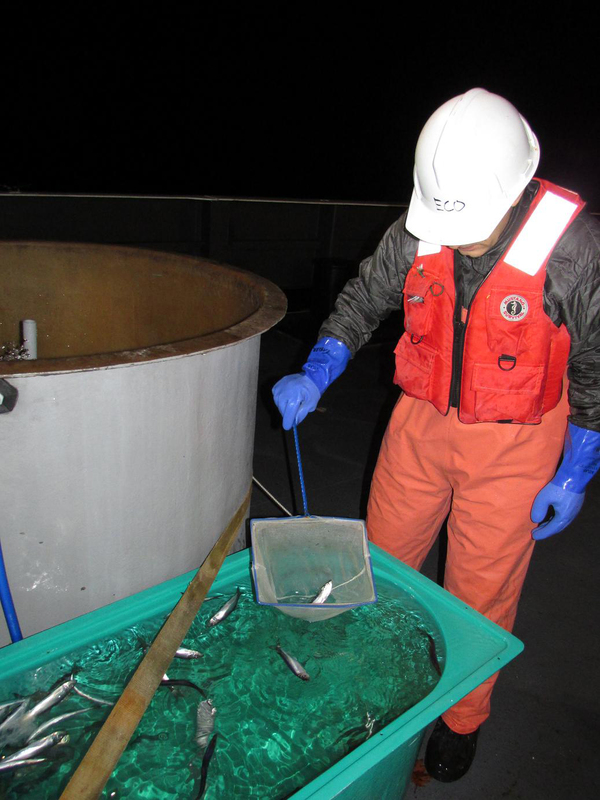 A midwater trawl made with an Isaacs-Kidd net on Friday near Wilkinson Basin did not produce any fish, but a tow made with another shallow-water midwater trawl off of Portland this morning yielded some one year old herring that appeared viable enough for the oxygen consumption experiments planned for this cruise. These have been placed in an on-deck holding tank for use later today.We did not see many strong signs of fish on the acoustics while we were on Georges Bank and there were almost no larval or juvenile fish seen in the bongo tows there either. This morning, while crossing the southwestern corner of Jeffreys Ledge, there was a strong signal indicating adult herring near the bottom. The CTD water profiles continue to show well mixed water columns at most of our stations, particularly shallower ones, but Wilkinson Basin, which we sampled last night, had bottom water that was cooler and more saline than the surface. With a favorable forecast for the next several days we are planning to leave the coastal waters of Massachusetts as the seas subside and head east and offshore, to cross the northern edge of Georges Bank and work our way north into the Gulf of Maine. Updates from this cruise will be posted on the nefsc.wordpress.com website maintained by Shelley Dawicki and Jarita Davis, together with photos of our activities. Following a blustery weekend spent making final preparations in Newport, Rhode Island, the NOAA ship Pisces departed at noon from the Newport Naval Station on Monday, November 3, 2014 to sail on the Fall Northeast Pelagic – Ecosystem Monitoring Survey. 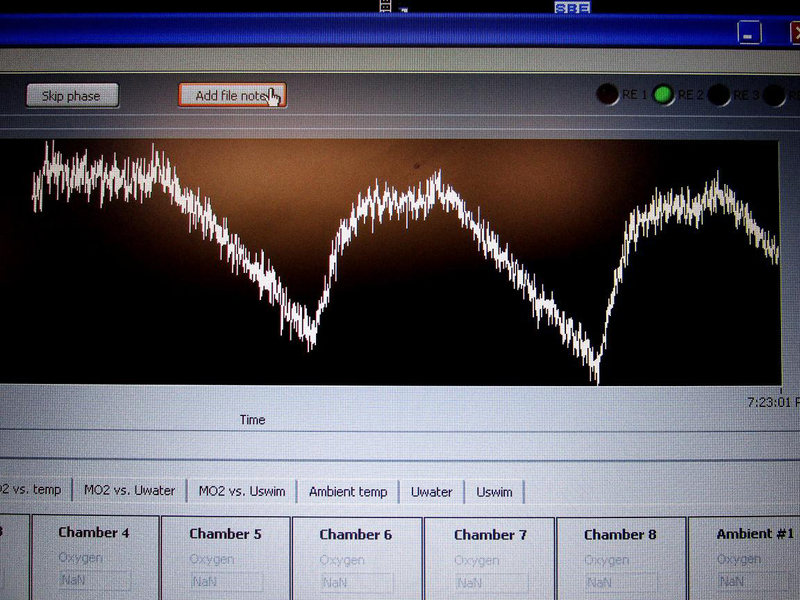 Calibration of the acoustic sensors being used to locate fish schools was conducted in Narragansett Bay by Mike Jech, Joe Godlewski and Mike Ryan. 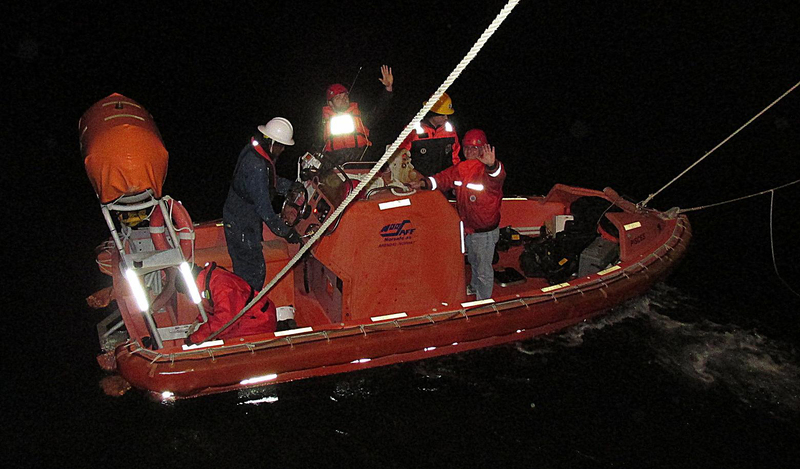 Upon completing their work that evening, Joe Godlewski and Mike Ryan were returned to shore via the Pisces rescue boat, after which the vessel headed out on rapidly diminishing seas towards Georges Bank. 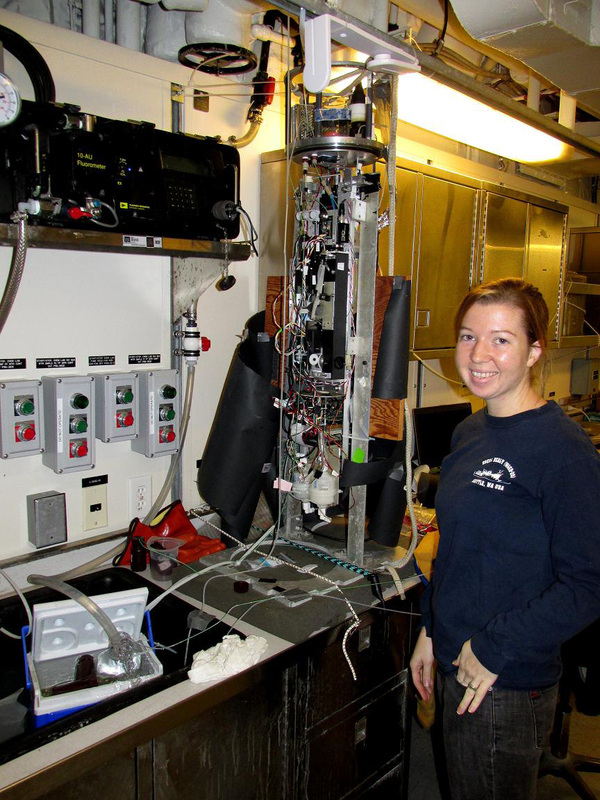 This cruise is a collaboration between NOAA’s Northeast Fisheries Science Center and Atlantic Oceanographic and Meteorological Laboratory, the Woods Hole Oceanographic Institution, and the University of Maine. 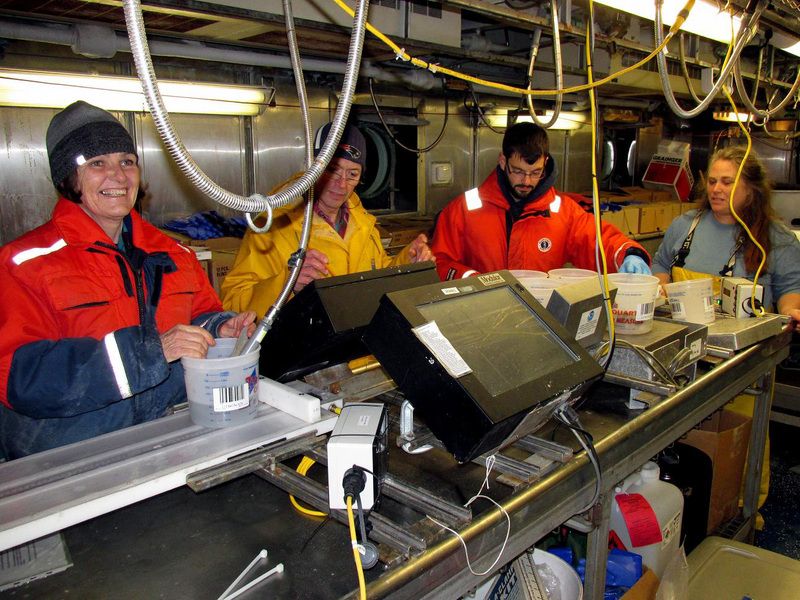 In addition to the normal complement of plankton nets, midwater trawling nets and hydrographic gear carried for these surveys, the vessel also has two respirometer chambers set up in the wet lab to measure the oxygen consumption of live butterfish captured in the trawls. 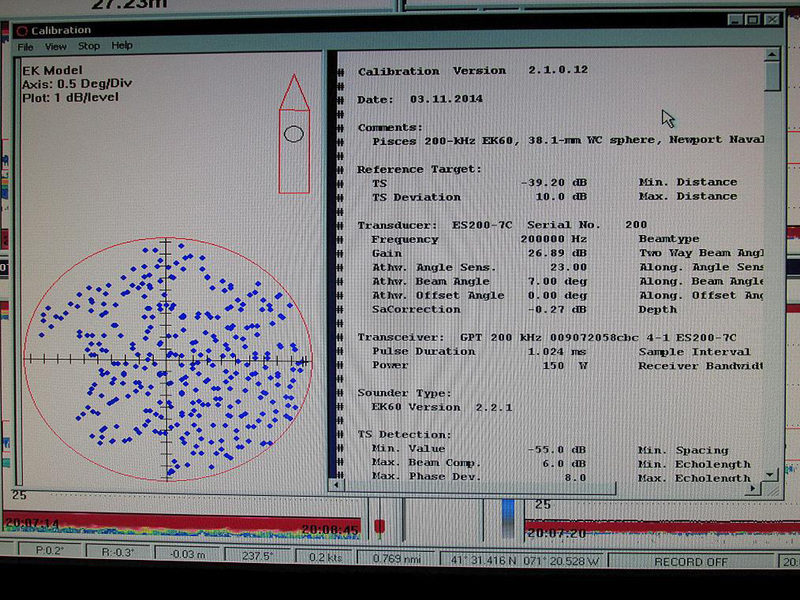 These data will be used to evaluate the thermal niche model used in a recent butterfish assessment. Initial bongo net tows in Southern New England waters approaching the Great South Channel had some juvenile hake in them. The temperature and salinity profiles in these shallow waters were well mixed which is not surprising given the recent strong winds. Midwater trawls will commence once the vessel is on Georges Bank. The weather right now is excellent and the vessel is making rapid progress with an eye on a storm system forecast for Friday. 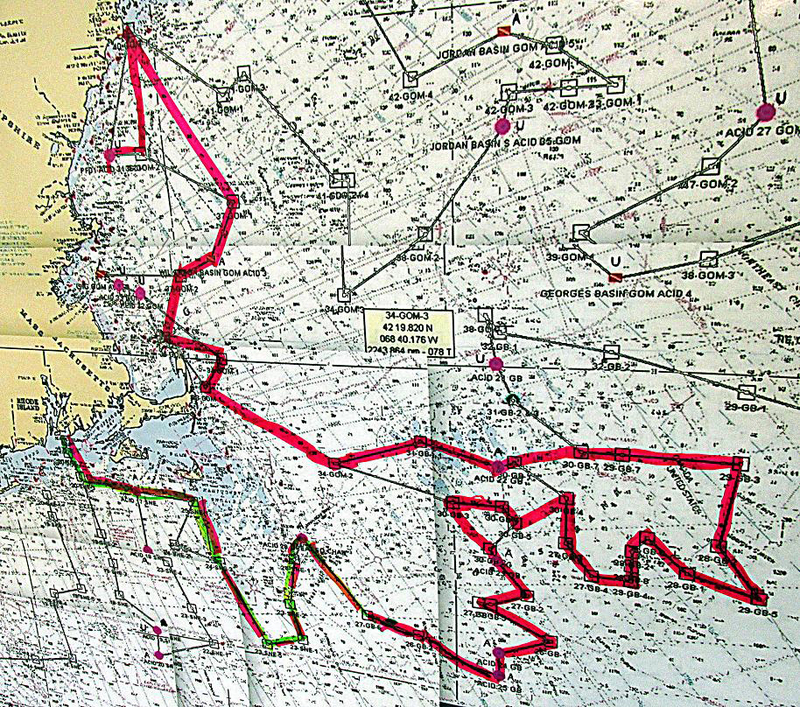 The immediate plan worked out by the command is to work our way east along the southern portion of Georges Bank and then loop west towards Cape Cod ahead of the advancing system, and hopefully keep working! Sunday evening finds us steaming southeast of Nantucket Shoals towards Georges Bank. We spent most of the weekend working the shelf of southern New England. This morning we had a nice sunrise over Great South Channel. We sampled a lot of stations with our main gear, the 60-cm and 20-cm bongo nets. 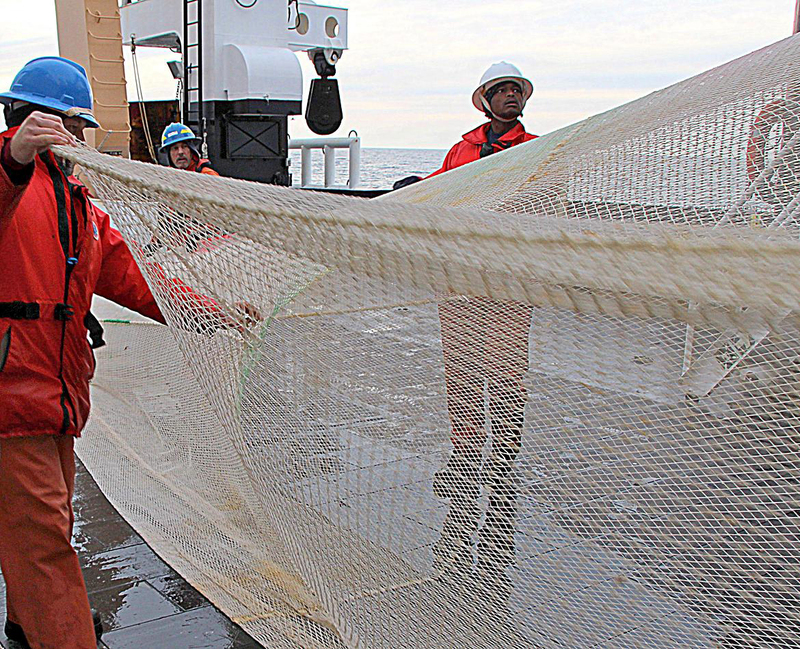 The 60-cm bongo nets are used to collect quantitative samples. 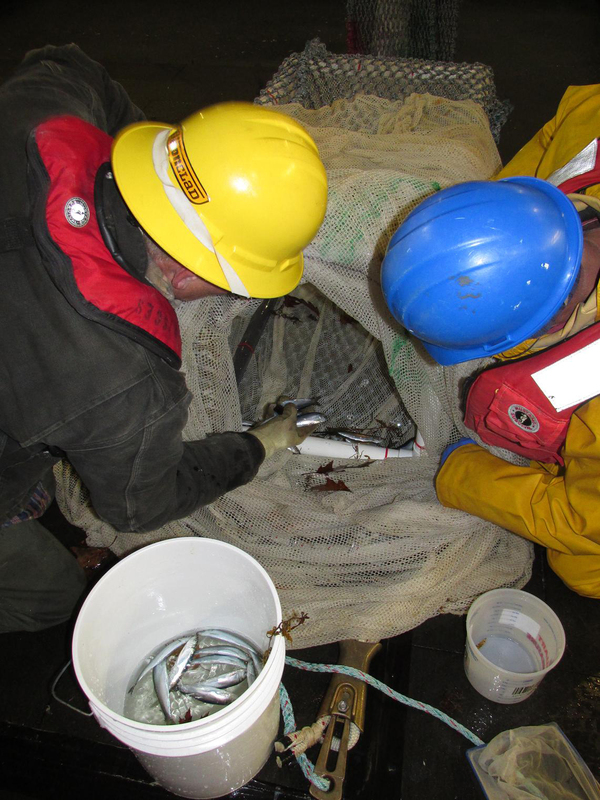 The nets have flow-meters in the mouth that allow us to calculate the volume of water sampled during a tow. This allows use to standardize the number of zooplankton or ichthyoplankton (fish eggs and larvae) in each net, then we can estimate the abundance of different species and compare all the stations we sample on the cruise. We are also collecting samples on this cruise that will be used to genetically identify the fish eggs and some of the different zooplankton species. These samples need to be preserved differently than the samples used to estimate abundances. The 20-cm bongos, or “baby bongos”, can fish at the same time as the 60-cm net, allowing us to collect more samples without spending extra time on more tows. 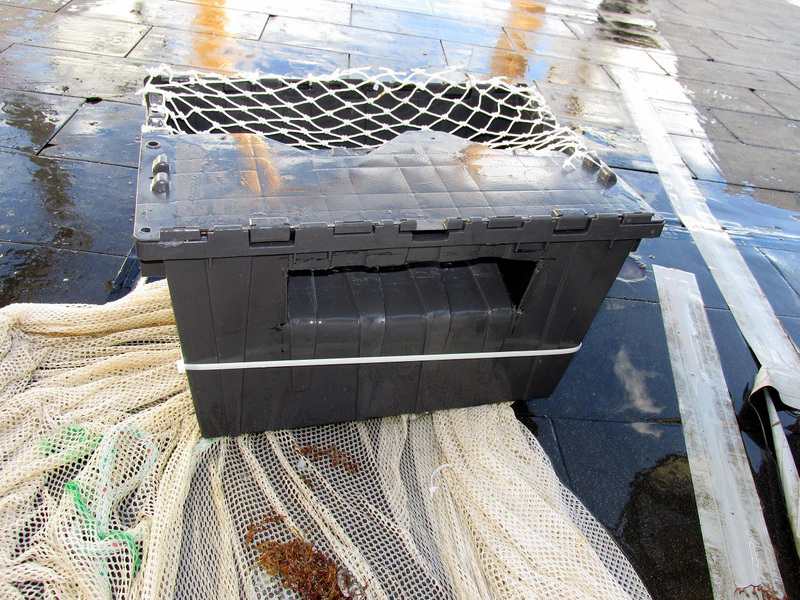 The nets are washed down and preserved for later analysis. 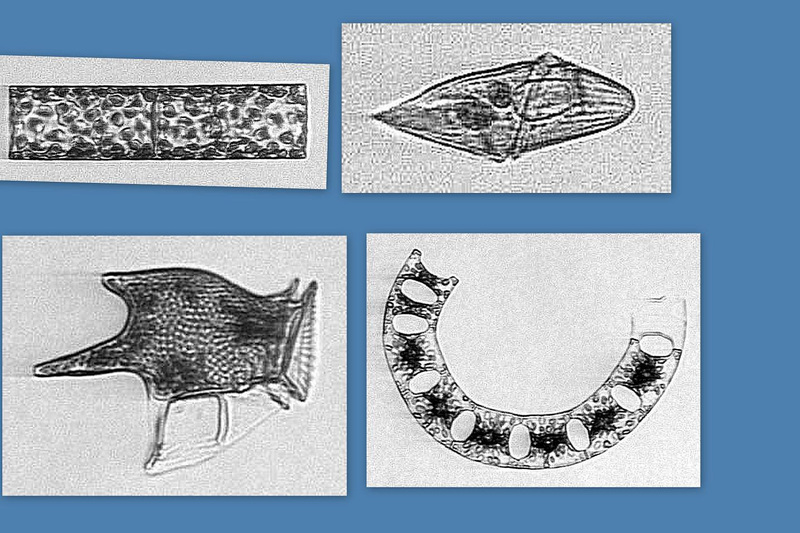 Often visual analysis of the plankton samples can give you a quick idea of the variation of zooplankton abundances and types across the stations sampled. Samples from the two regions we’ve collected in so far, Middle Atlantic Bight and southern New England, demonstrate this. The samples from the Middle Atlantic Bight have lower biovolume than those from the southern New England. 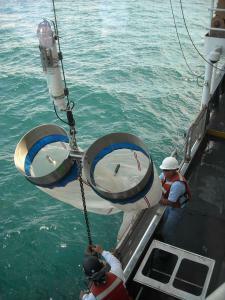 Biovolume is the amount of plankton collected at a station, and can give a rough measure of production. The southern New England samples have greater biovolume than the Middle Atlantic Bight stations. 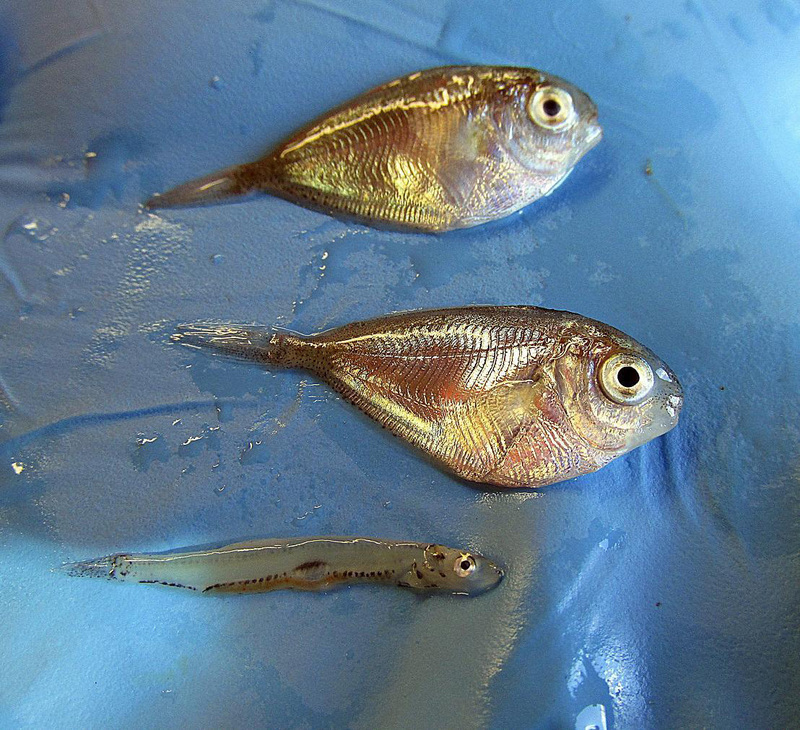 However, the samples from the Middle Atlantic Bight have more Atlantic menhaden larvae (long skinny white fish floating in the sample on the left from Middle Atlantic Bight). 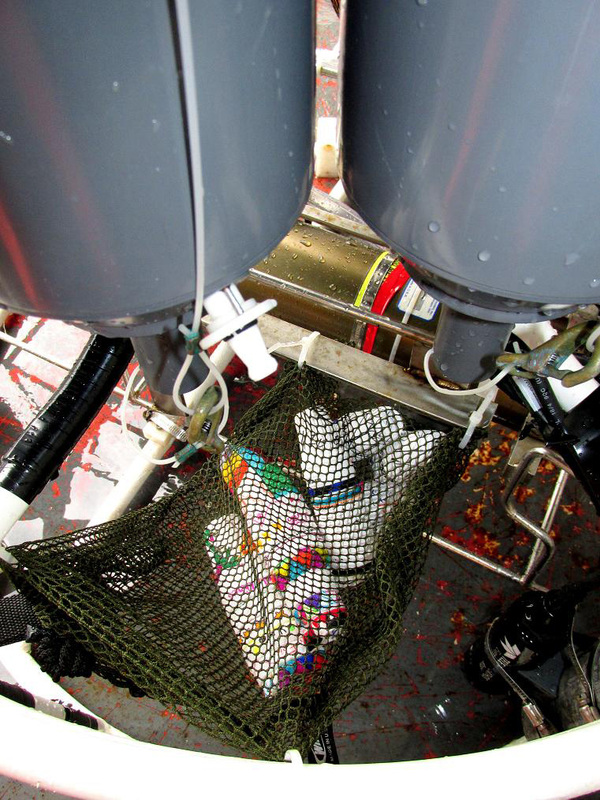 Estimates of menhaden larval abundance will be calculated after the samples are processed later in the lab. Everyone on the ship has been enjoying the clam sunny weather of the past weekend, especially in light of the storms forecast for the beginning of the week. 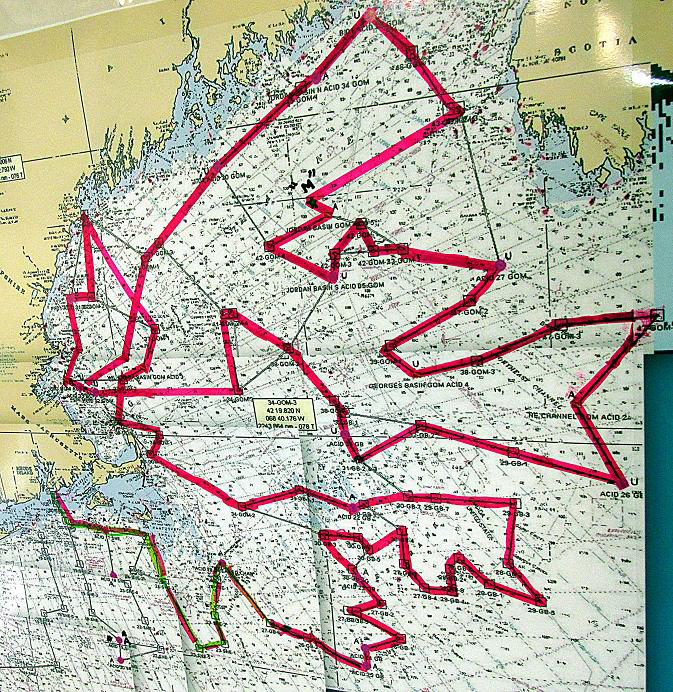 We hope to be able to stay out in the Georges Bank region and ride out the worst of the winds and waves.